Continuously increasing high production standards in advanced technology industries require utmost attention in eliminating every thinkable risk of particle contamination in cleanroom areas. Conventional wet- and half wet cleaning procedures bare the risk of just raising dust particles into the air without binding them once and for all. MICRO CLEAN ROLLER and MICRO CLEAN SOFT ROLLER cleaning devices are a safe and easy-to-handle alternative for eliminating dust and particles on even as well as uneven surfaces, such as inspection tables, walls, floors, etc. The adhesive film safely binds particles without leaving any adhesive residues on the cleaned surface. MICRO CLEAN ROLLERS offer an excellent and easy method to control the presence of dust by making it visible. Sticky roll provides the most efficient means of removing small particles from flat surfaces such as walls, tabletops, floors, ceilings etc. The adhesive on the sticky film not only removes dirt particles but also provides an inhibitor to prevent microbial growth, which makes it suitable even for general and cleanroom use. Sticky roll is composed of Polyethylene sheets coated with acrylic-based adhesive. 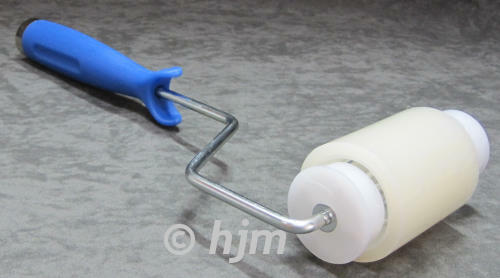 The sticky roll should be placed on the reusable, non-contaminating plastic roller handle. Now roll over the area which has to be cleaned - particles will stick on the Polyethylene film and will not be released. Contaminated layers are easy to remove - then roll is ready to use again. Don`t just blow the dust around - trap it permanently with the PCR ROLLER and tacky pad system! 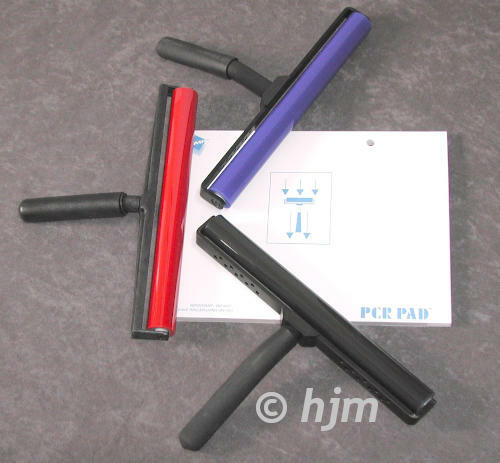 RRMC125 Micro Clean Roller: For even surfaces 125 mm 1 pc. RRMC500 Micro Clean Roller: For even surfaces 500 mm 1 pc. RRMCS250 Micro Clean Roller: For uneven surfaces 250 mm 1 pc. RRGMC9H Handle 250 mm 1 pc. RRGMCEX13 Handle extension Length: 1.3 m 1 pc. RRGMC3HB Handle for cleaning roll MX 1 pc.